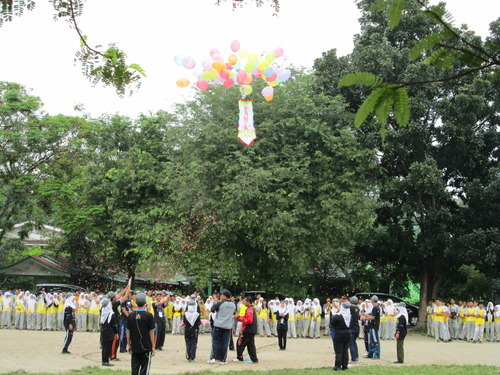 Any Indonesian school event is incomplete without the requisite speech at the beginning. You need an upacara (oo-pa-cha-ra) — a flag ceremony – and it is an ordeal. Some schools do it every week but mine seems to think they take long enough to be reserved for special occasions. The police conducted one during my second week, and there was another on Hari Guru (Teachers’ Day). The latter included three incidents of fainting (jilbab + hot sun + good lookin’ bule = swoon). 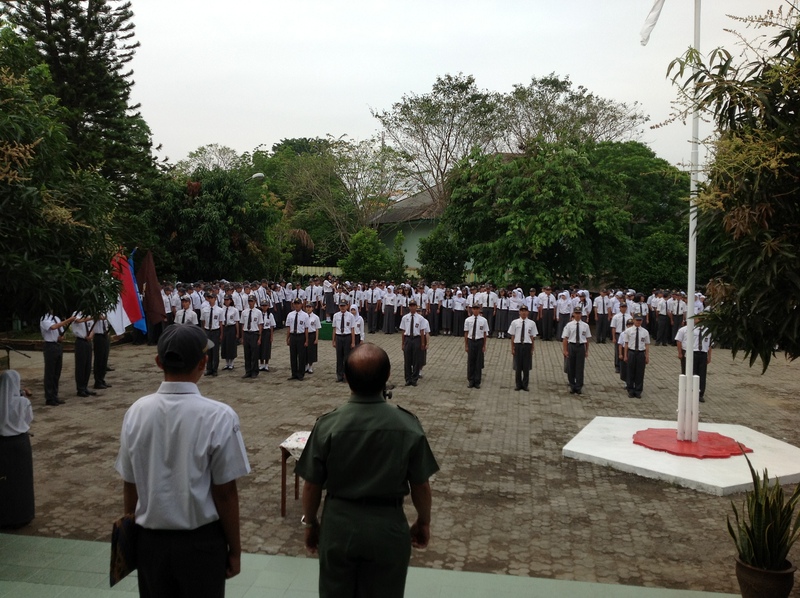 During a typical upacara, the students form lines according to their classes and stand idle for about twenty minutes. Then a responsible adult barks in unintelligible Indonesian and the students touch outstretched fists to the back of the person in front of them, creating equal distances between each student. This really does produce nice lines; we should do it in the U.S. army. The worst thing in the world is when you suffer through a whole upacara in the hot sun and then it turns out you were just doing a practice upacara and the real upacara will start…now. Tuesday’s upacara was conducted under more ideal conditions: it was a cold morning and students were assembled on the soccer field, which is partially shaded in the early morning. The students saluted as the principal took the stage. One of the teachers asked me if we did that in the states and I almost laughed — can you imagine saluting a principal? A high-school principal? My respectful students stood at attention while the principal gave a speech about the importance of sports and arts week. This upacara was the opening event of the week. That sounds right. The school teachers and administration giving these speeches were products of the New Order education system and of course do many of the things they saw done. Panca Budi sure knows how to start off an exciting week. About the author: Seth Soderborg is a Fulbright English Teaching Assistant based in Medan, North Sumatra. He graduated from the University of Michigan in 2012 with a degree in political science. Soderborg previously worked in Brazil and Mozambique. Contact him at seth.soderborg@gmail.com. ← Do you speak Indonesian? Ya? Pingback: Happy Teachers’ Day / Thanksgiving – Where in the world is Kelly?